But I’ve got to come clean…this year, I’m running out of time to be creative! I’ve got sooo many Christmas presents to finish, and a couple of orders to complete, too. Never fear though! I can always find a way to make the simplest thing the most fun thing if I try hard enough. I am still determined to make a bunch of hats, but this year I’m sticking to ONE hat pattern. I’m just going to change up the types of yarn and the kinds of striping to keep it interesting for me! 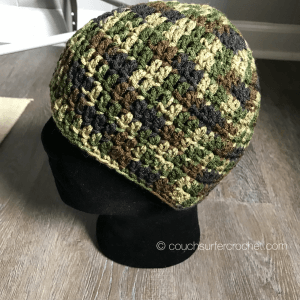 This crochet hat pattern works up really quickly. Once I got it down I pretty much have it memorized which makes it an awesome “go to” pattern if you are looking to make something fast! 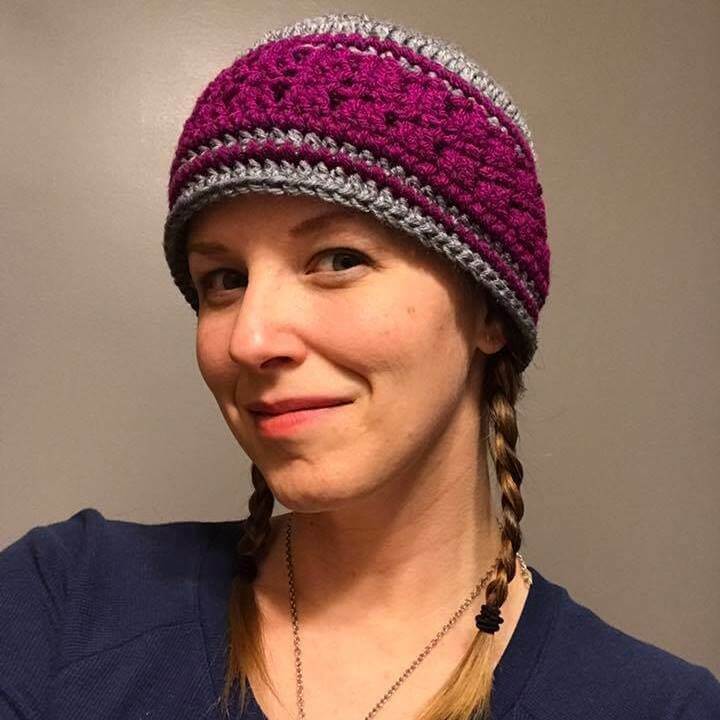 These hats make great Christmas presents if you are looking for something easy to make for friends and family this year! 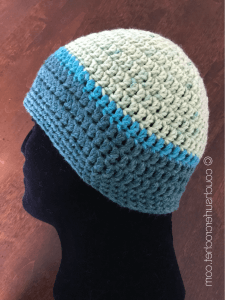 I have decided to call this the Switch It Up Beanie since you can truly explore your creativity with color once you learn this simple pattern! For the one pictured above I used Caron Jumbo yarn in Peacock and Caron Simply Soft in Plum Perfect. For this hat I used an I/9 (5.5mm) hook. It is sized for an adult man. For women’s size, skip R7. For child’s size, skip R6 and R7. Voila! Now you have a sweet new hat you can show off! I hope you have enjoyed this pattern! For the hat above I used Red Heart Super Saver yarn in Camouflage. These are really popular with people where I live. Lots of folks are into outdoor activities and these hats really come in handy! They also have Pink Camo, and Desert Camo if you want to stick with that theme! You could donate those to members of the military and their families! I think that would be a pretty cool gift! 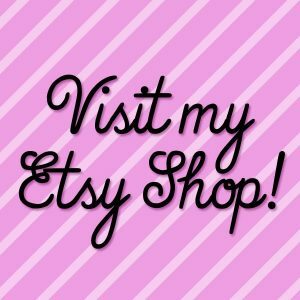 Right now Red Heart has free shipping on all orders over $25!! For the hat above I used Caron Cakes yarn in the Faerie Cake colorway. The main pattern for this hat is sized for an adult male. By starting at one end of the cake, I found I could get approximately 3 full hats out of one cake. If you have never worked with Caron Cakes before check out my Yarn Review. 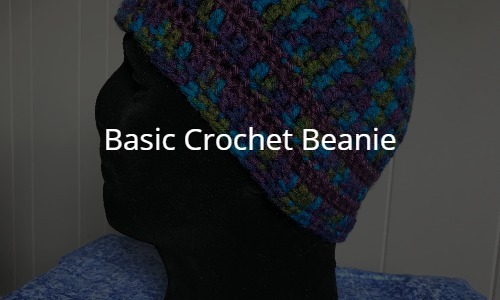 You’ll find another hat pattern there, as well as a scarf pattern. If you’re looking for a BIG (but super fun) project to take on, check out the Hip to be Square Crochet Along or the Mixed Stitch Blanket Crochet Along. Both of these were my 2017 Crochet Along patterns. We are now finished with these projects so both patterns are completely available! You can work on them at your leisure! 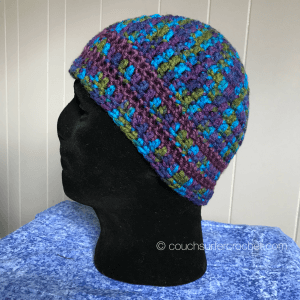 Please feel free to share any version of these completed patterns with me on Instagram, or join the Couch Surfer Crocheters Facebook group and share with all of us there!